Hello and welcome to our newly refurbished Property that is set close to the old town of Puerto del Carmen. About 10 to 15minutes walk from the Biosfera shopping centre, Playa Grande beach and 10 mins from the Harbour. The Seaviews from all windows are stunning. We have recently refurbished with new beds, air con, sofa, Large television with Netflix, Shower and appliances. The pool is situated at the rear. There are child locks on all windows and a guard rail outside. We are close to all amenities so there is no need to hire a car if you are just staying local. This is a quiet complex so no party goers & stag/hen dos etc. Families and older couples who will respect our property and neighbours PLEASE. Rob & Sara are welcome in our home any time. We have just come back from a week in the apartment and had a fabulous time. The apartment is equipped with everything you need, kettle, toaster, washing machine, microwave, etc. Such a lovely surprise to have milk, tea, coffee, sugar and beer left for us, thank you. There are two pools by the apartment, both are really nice, and one has a pool bar serving drinks and food. The beach and harbour are about 15-20 mins walk away, and the fish restaurants by the harbour are fantastic. Thanks James and Laura for a love,y holiday and we will definitely be back when we are next in Lazarote. Great location. Well equipped and wonderful sea views. 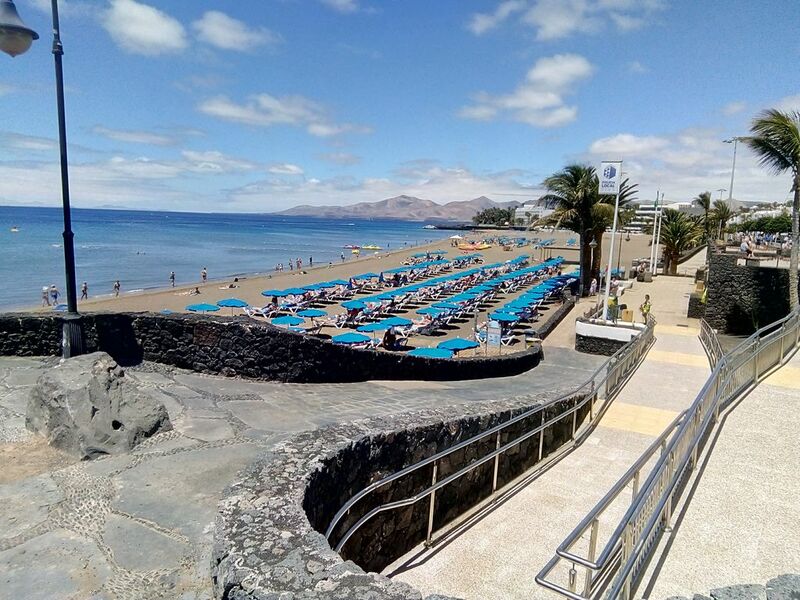 This was our 6th Stay in Puerto Del Carmen and this was by far the best accommodation we have rented. It is well equipped, in a great location and very comfortable. We had friends come to dinner and they were also impressed. Thankyou for your comments we are so happy you had a lovely holiday and you are welcome back. L'appartement est très fonctionnel, parfaitement situé à la fois dans Puerto Del Carmen (proche de toutes les commodités et de la vieille ville) et sur l'île (point de départ parfait pour rayonner sur l'ensemble de l'île). Appartement très propre, calme, avec une vue superbe sur la mer. Notre arrivée a été largement facilitée par les propriétaires. Nous y reviendrons avec plaisir. Thanks a lot James for the quality of the apartment and for your welcoming ! Muriel Frank & et Les garçons sont une famille charmante et sont les bienvenus.